Maintaining a litter box is a necessary evil when you own a cat. Most pet owners hate the trial and error required to find a cat litter that works for their feline. After all, selecting the wrong type of litter can require more cleaning on a daily basis. You might also find that you are throwing away too much litter, ultimately wasting your hard-earned money. It’s time for you to try the best clumping cat litter available. 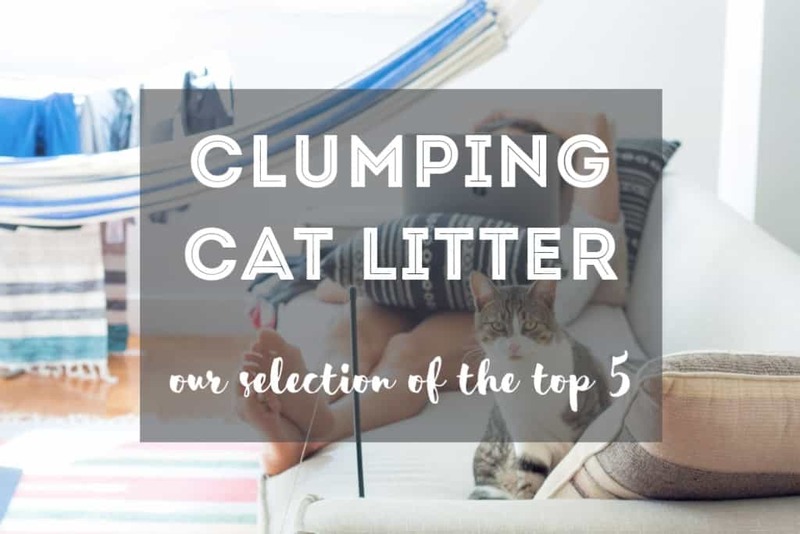 If you are more than ready to get your cat’s litter box under control, you will want to see what our top picks for the best clumping cat litter can offer. We bet they will save you time and money when it comes to taking care of your furry feline! One of the first hang-ups you might have with the litter box is what type of litter to purchase. There are generally considered to be two types of cat litter – clumping and non-clumping. Pet owners tend to prefer clumping cat litter because it is much easier for them to clean. Let’s take a closer look at how each type of cat litter works and why you will want the clumping variety. Non-clumping cat litter is great for absorbing urine and reducing the odor associated with this space. However, it will eventually run out of absorption and urine might pool up in the bottom of your litter box. With this type of litter, you will need to empty the entire box and scrub it clean on a far more regular basis. On the other hand, clumping cat litter is bound to make your life much easier. The wet litter in the box quickly clumps together because of the bentonite (or some other type of all-natural ingredient). This makes it quick and easy for you to remove the urine and the feces using a scooper. Ultimately, this helps to keep a lid on the strong odors associated with litter boxes. Nothing pools up in the bottom of the litter box, so you can avoid cleaning it as frequently. All you need to do is add a little fresh litter to replace what you scooped out already. You can drastically reduce the amount of time you spend scooping out the box at the end of each day when compared to non-clumping cat litter. Because you don’t need to empty it entirely every few days, you can also save money on the cost of your litter. Finding the best clumping cat litter should be a priority if you want to make this chore a little easier for yourself. Are you searching for a natural clumping cat litter that will help to reduce the mess in your home? 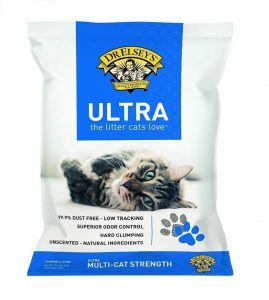 Dr. Elsey’s Cat Ultra Premium Clumping Cat Litter might be just the thing for your feline. This litter boasts great reviews on Amazon with the majority of them being positive. For a natural clumping cat litter like Dr. Elsey’s, expect to pay the $ range which is a great deal. Be aware that you might need to clean your cat’s paws occasionally after switching to this litter because it can dry in between their pads. 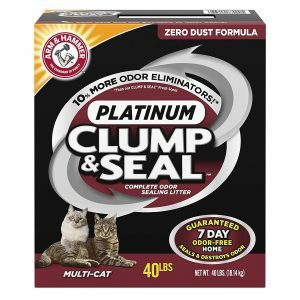 The Arm & Hammer Clump & Seal Platinum Cat Litter is one of the most well-recognized brands on the cat litter market. Many pet owners will initially try this brand because it promises to seal odors into the clump using their moisture-activated granules. They have plenty of odor eliminators in addition to their standard baking soda to keep your litter box smelling fresh. In fact, they promise that their sealing litter can keep your home smelling fresh for up to seven days. The Arm & Hammer Platinum litter has similar “pawsitive” star ratings as the Dr. Elsey’s brand. However, this name brand is slightly more costly ($$). Some customers do note that the citrus scent of this brand is very strong, so keep that in mind if you or your feline are sensitive to smells. 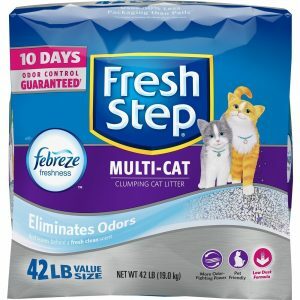 Fresh Step Multi-Cat with Febreeze Freshness promises to bring a refreshing scent to your home. It has activated carbon traps that can help to stop the odors associated with bacterial growth. Fresh Step is so confident in their litter’s ability to control odors that they promise ten days of odor-free litter boxes. Fresh Step is definitely the most expensive brand on our reviews of the best clumping cat litter. For a slightly larger box (42 pounds), expect to pay the $$$ range. The price might be a deterrent for some pet owners, even though it is an otherwise fantastic litter. The Tidy Cats 4-in-1 Strength Clumping Cat Litter is ideal for pet owners who want to keep their litter box smelling fresh and make things easier to clean. It can easily clump together your cat’s urine and feces while maintaining a fresh scent throughout the home. 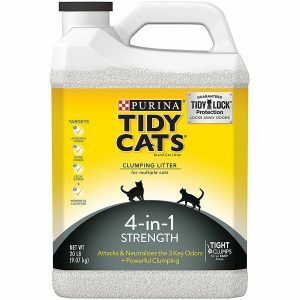 The Tidy Cats 4-in-1 Strength Clumping Cat Litter is almost the same in price as the Arm & Hammer brand ($$ range for 40 pounds). They have roughly the same rating as well. One of the most common complaints is that consumers don’t care for the smell of this litter because it is very strong smelling. You may need to try it for yourself to decide! 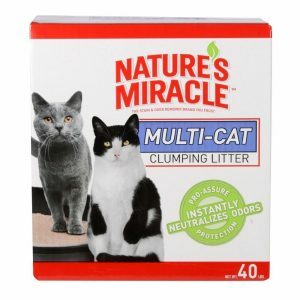 If you want a product that is made from all-natural ingredients, consider the Nature’s Miracle Clumping Litter. This product will absolutely be safe for every member of your home, including your fluffy kitty. It can neutralize odors just as effectively as many of the leading brands but without the harsh chemicals. It has the second highest rating out of all the best clumping cat litters. However, it does have a significantly lower number of reviews to base the rating from. The price of this litter is definitely exceptional (one $ price range). Purchasing the best clumping cat litter is essential to maintaining your litter box and keeping the odor your cat’s urine and feces out of your house. It is essential to choose the right one, so you need to consider price and features before you decide. Both the Arm & Hammer and Dr. Elsey’s litters offer affordability, great reviews, and excellent features. They may be a great starting place to help you find the best clumping cat litter for your kitty. 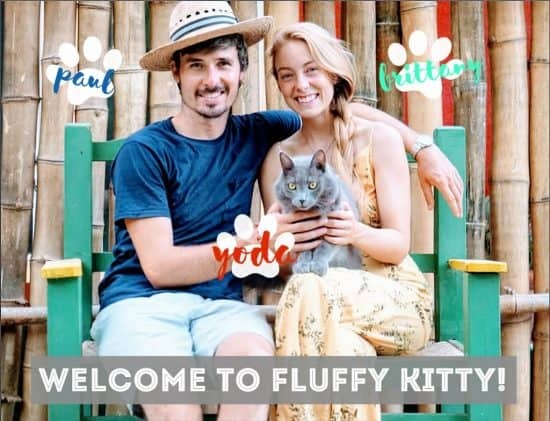 Next Post Can Kittens Eat Adult Cat Food?